I used to take my notebook to a lonely corner of Preah Khan, one of the Angkor temples, and I’d sit in a doorway of cobwebs, gazing out on ancient stones like these. I used to revel in my solitude there, thinking and writing and listening to the muffled buzz of bees. I still love Preah Khan in its crumpled state — though its state changes day by day, month by month, as its pieces are restored. 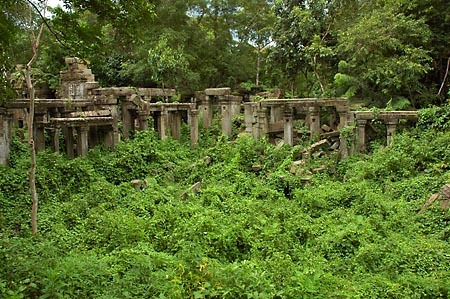 But an even bigger change has swept through the Angkor temples in recent years. 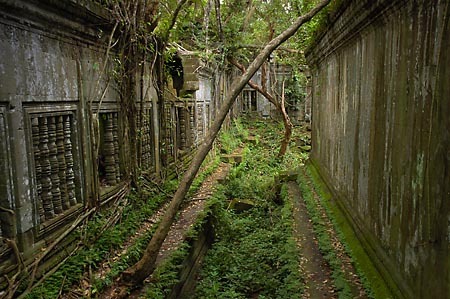 That solitude, those quiet corners — nearly impossible to find anymore in any of the ruins on the main tourist paths. Jerry and I used to dangle our feet from the stoop of the library facing Angkor Wat; we’d crack open a beer and watch the sun fade, nearly alone. No more. The crowds keep pouring through. Or we’d climb the steps of Phnom Bakheng and watch the sunset from on high, just a dozen others around us. Not today. Today, the mountain jams with 500 people or more, all with cameras perched and poised, pointing in the same direction, toward Angkor Wat in a fireball sky. But here’s what most tourists miss: The untrammeled temples, the places way out there, the destinations not noted in guidebooks. Plenty of those gems remain in Cambodia, all across the country, and I won’t tell you where they are. You must find your own. (That you can is one of Cambodia’s greatest attractions.) This above and below, Beng Melea, is not the perfect example, as it is listed in guidebooks and it does see a steady stream of tourists each day — about 30 on average, according to one of the caretakers. But still, it’s 2 hours by tuk-tuk from Siem Reap and it requires a drive through fields so remote you can stop for a potty break and hear nothing but the wind. I love this temple for its massive trees and the way nature is an essential facet of its character. Beng Melea isn’t Beng Melea without all this. 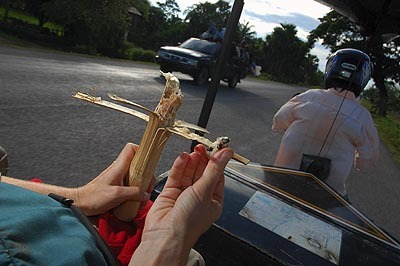 On getting here, we start off on the main highway heading toward Phnom Penh. We pass a wreck with fresh blood on pavement and a vanload of people gathered by the roadside — these scenes, too familiar. An ambulance has already come and gone, and we continue up the road. Traffic lightens and we are soon in the painting of Cambodia as I see it in my head: red dirt, blue sky, puffy clouds, luminous paddies of rice with palm trees reaching forth. 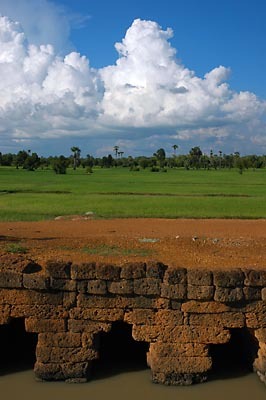 Toss in an ancient bridge (like the one below), a few workers in the fields and there you have it: the quintessential image of countrified Cambodia. Now sniff the air: it smells of m’aohm. 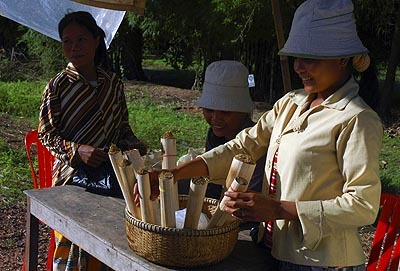 A little farther east is a blip in the road, Khchass, where dozens of women sell sticky rice tubes. They raise parasols over little tables set by the roadside. Behind them, small fires crackle with blackened sections of bamboo cooking in the flames. Inside is a delightful glutinous mix of rice and beans and coconut, slightly sweet. Â It looks so inviting; I vow to stop for some on the way back. — except the realization that it’s an exceptionally wonderful day. Not sure what you mean… visitors shouldn’t learn the mysteries of the temples? The temples have too many visitors?